Center City, Philadelphia is home to countless businesses, restaurants, shops, and nightlife opportunities—and at the Comcast Center, locals can enjoy all of that in one place. The Packard Motor Car Building apartments near the Comcast Center in Philadelphia put residents just minutes from the hub of commercial activity. The center is among the famous buildings that make up Philadelphia’s skyline. While its unique style and title as the city’s second-tallest building make it stand out among Philly’s many skyscrapers, the opportunities that abound among its 58 floors are just as distinctive. The building is the corporate headquarters of one of the world’s largest media companies, Comcast. 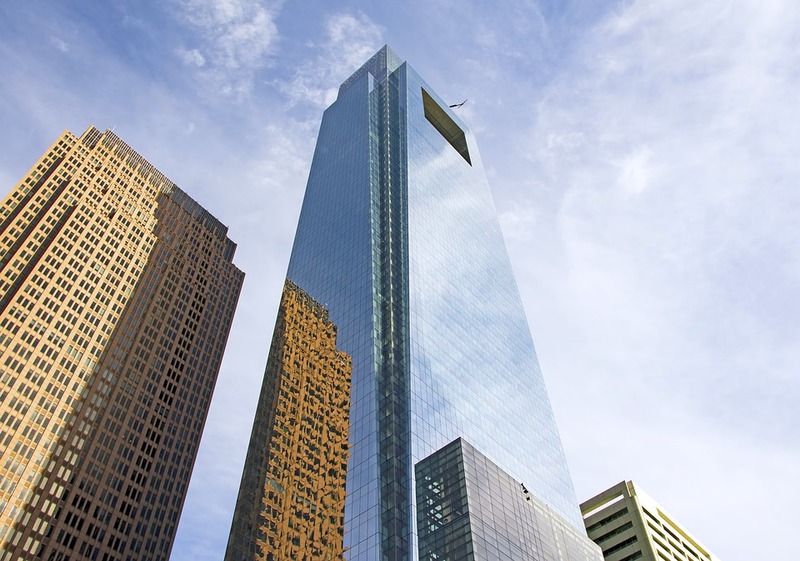 Apartments near the Comcast Center in Philadelphia, like the Packard, are a perfect fit for those interested in employment opportunities with the company. Comcast Corporation employees who work at the building can walk to the Comcast Center in just minutes, avoiding the traffic congestion and rush hour headaches that so many have to endure on their way to work, freeing up their time to enjoy the amenities at the Packard and the surrounding areas. The Packard Motor Car Building apartments near the Comcast Center in Philadelphia also allow non-employees to take advantage of all that the building has to offer. The Market & Shops at Comcast Center is a public retail center that is one of the area’s most popular spots for dining and shopping. The market features a dozen different restaurants, offering everything from Asian fusion to bakeries and, of course, cheesesteaks. The area around Comcast Center is one of the city’s busiest business districts, and the market is a prime spot for local workers and residents to have affordable and convenient meals. The center also houses a number of shops, such as high-end fashion boutiques and gift and snack shops, designed to meet the varied needs of the neighborhood’s busy, on-the-go population. The Comcast Center is also a gathering spot for local residents, who can enjoy the frequent networking and nightlife events held on site. When the weather is nice, locals also flock to its half-acre public plaza, a perfect spot to enjoy the sights and sounds of Center City, Philadelphia. Check out the photo gallery of the Packard Motor Car Building’s luxury studio, one-, and two-bedroom units, and contact us to visit your next apartment home. We invite you to experience The Packard Motor Car Building's Center City, Philadelphia apartments. Stroll our neighborhood, visit the museums, then enjoy a unique dining experience at one of the many restaurants nearby. This is what home in Center City feels like—exceptional! Walk through our building, rich in history. Check out one of our apartments to see the elegant design and amenities we provide to all of our residents. Ask about the complimentary membership to MetroFit fitness center. Then inquire about reduced security deposits and waived applications fees through our preferred employees program. Complete the form below or call our leasing office at 215-351-0930 to schedule a tour.